How to create simplest Fiori application locally: step-by-step from CDS View to Fiori Launchpad. Part 1. It was interested for me to create a Fiori application with local SAP WEB IDE. Perhaps, you will be interested in my experience. 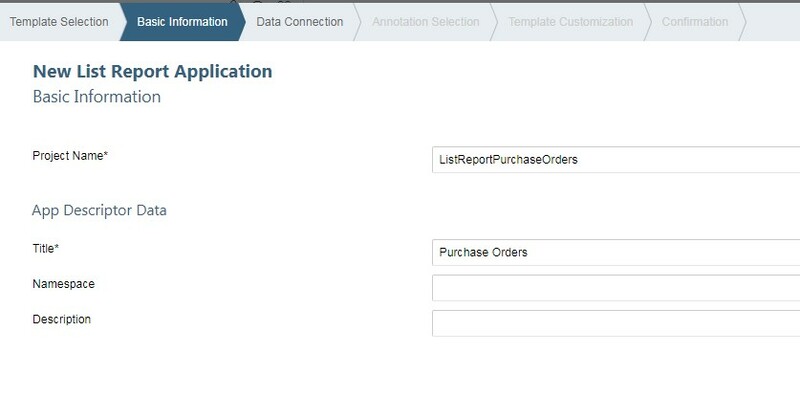 This blog will guide through all steps of this process: from tables on local S/4 HANA system to completed simplest SAPUI5 report with Fiori Launchpad on frontend server. 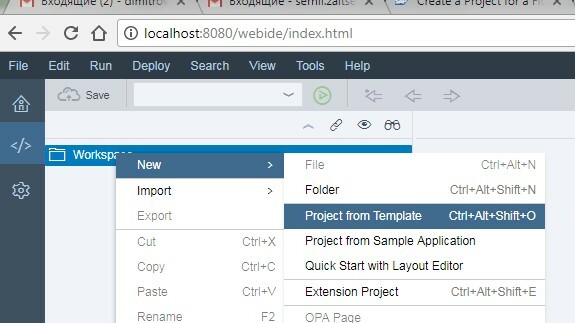 The local WEB IDE is used education purposes, for production working we have to use SAP Web IDE in the cloud and SAP HANA Cloud Connector. The example is not a reference, I will only demonstrate key solution steps. I suppose you have initial information about FIORI technology. I suppose that you have fully configured Fiori Landscape. This configuration is not subject of the blog. Picture below contains main logical components the Fiori Landscape. Components of the frontend server highlighted in red, the backend server highlighted in blue. All developer tools highlighted in green. 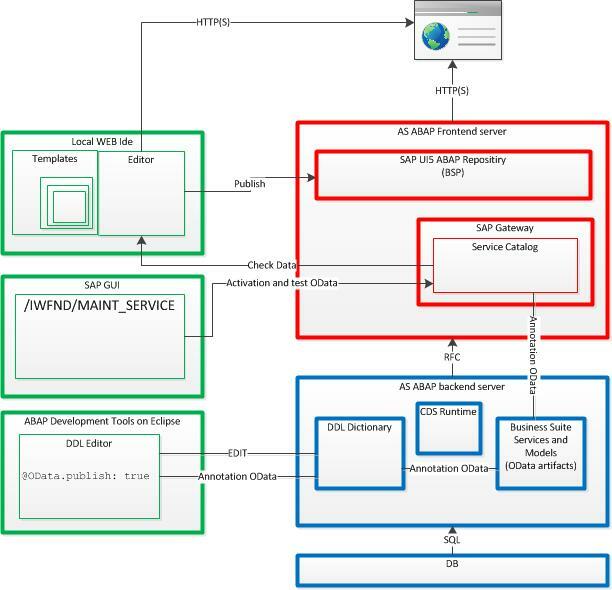 ABAP front-end server contains all UI components of Fiori system and NetWeaver gateway. 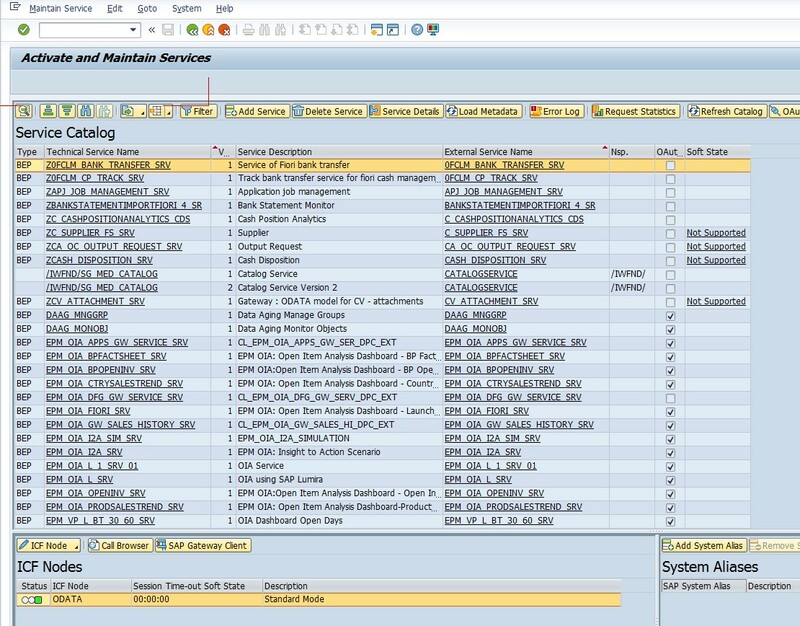 SAP NetWeaver Gateway is used for connecting between frontend system and SAP business suite system (backend). The OData services working with the gateway. On backend server business suite services based on CDS View. OData services get data from backend services via RFC. 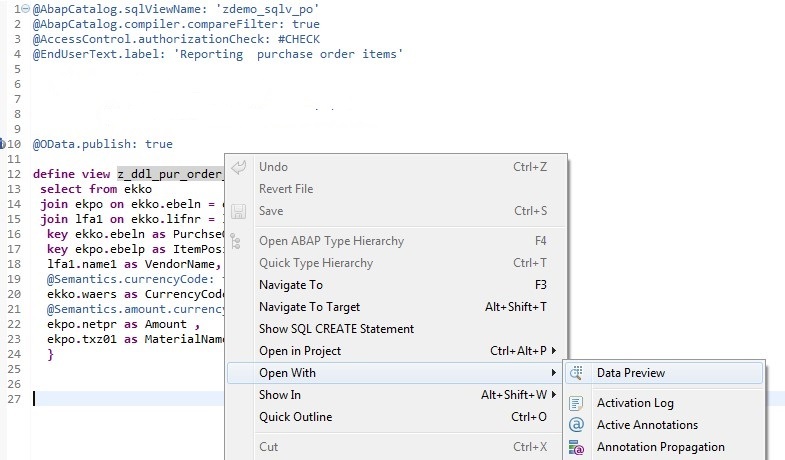 SAPUI5 applications consume OData services as data source. The developer authorizations for frontend and backend systems are need to create ABAP development objects (including ADT authorizations for backend). Also, authorization for transaction /IWFND/MAINT_SERVICE, role ZSAP_UI2_ADMIN and authorization S_PB_CHIP, S_RFC_CALC on frontend server are need. It will be convenient if you have SAP_ALL authorization on both systems, but it is not enough for running of Fiori application. This question will be discussed in second part of this blog. Purchase order header and item tables will be used as data source for our simple report. 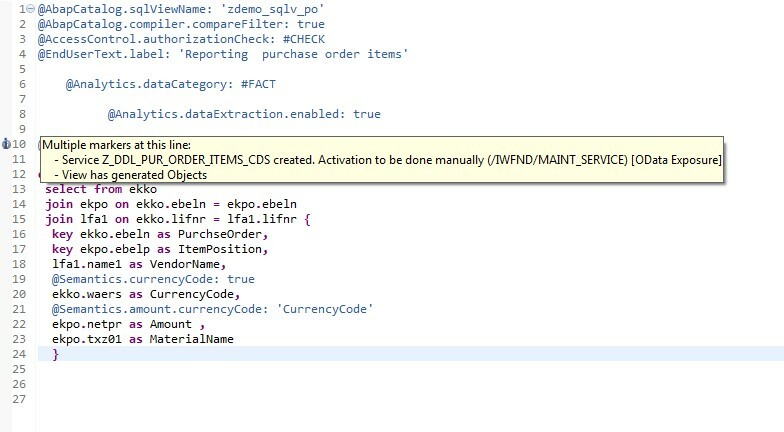 First, create a DDL source in ABAP Development Tools for defining an ABAP CDS. It’s important, – a name of the CDS View can contain no more than 25 characters! I used ‘z_ddl_pur_order_items’ as the name. Choose Next and assign a transport request (or you can use package $TMP). There, “zdemo_sqlv_po” is name of our dictionary sql view. As data source was used simple joins with ekko (header for purchase document), ekpo (items for purchase document) and lfa1(vendor data) tables. I use very nominal approach, please, use this select only as an example. Result are the same data that in the our sql view “zdemo_sqlv_po”. Now, our CDS View will be exposed as OData service. to our CDS View and activate it. After reactivation of this CDS View with OData annotation, OData service artifacts ere created with name <CDS_VIEW>_CDS. 001 is version of the services. IWMC object is Gateway model and IWSV object is the service of Gateway Business Suite enablement. 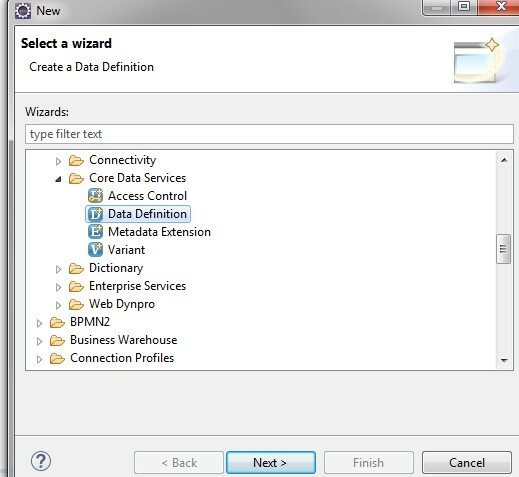 3.Activation OData service on the gateway. Having service artifacts, we can go to next step – activation OData service on frontend server(gateway). After this, the OData service will be connected to corresponding back-end service. Now, we start working on frontend server. Enter your package name, or $TMP, if you did not need to transport your service. SAP Gateway Client window is opened. For test the OData service press “Execute”. 4. 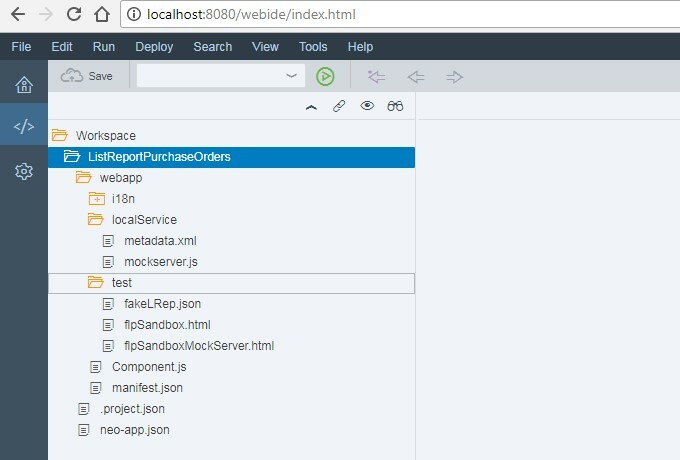 Create Fiori (SAPUI5) application. I installed and run a local Web IDE on my workstation according to part 10 of document “SAP HANA Cloud Platform, Web IDE Developer Guide”. This may take 10-15 minutes. The most important thing is: a file with description of our frontend server must be created. There is destination to OData services for FIORI application (see link “check data” on Picture 1). As filename I used <SAPSID> of my frontend server. Go to http://localhost:8080/webide/index.html . For first time you must create your login and password. After successfully login we have to create a project for Fiori Application. A template “List Report Application” will be used for our report (as simplest variant). It’s important! I reduced SAPUI5 version of new project to 1.38 because of SAPUI5 version of my frontend server is 1.38 only. You can check your version follow link http://<host>:<port>/sap/public/bc/ui5_ui5/, where <host> and <port> are host and port of your frontend server. This version of your application must be less or equivalent that version of server. Next step is very important. We select server with OData services. Do you remember the file in begin of this step? This connection will be used as a data source (see arrow “check data” on Picture 1). There is name of our connection on picture 21.
there are our OData service and its CDS View! 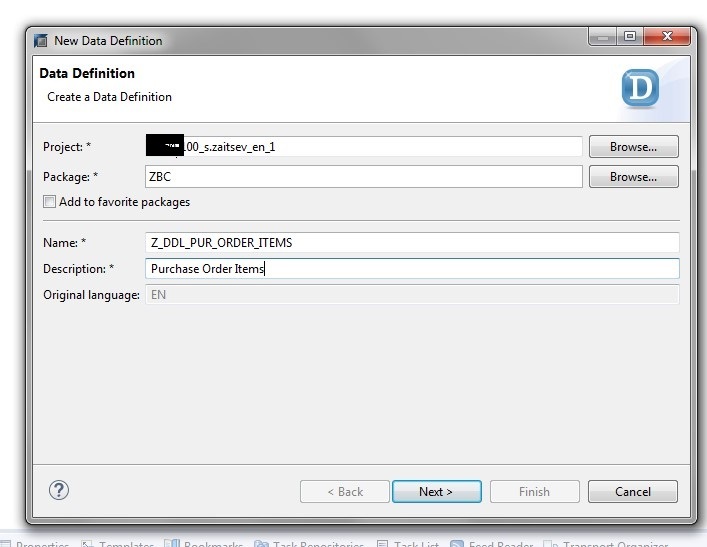 We skip next screen (annotation files) and assign the CDS view from our OData service to Data Binding template parameter. Then choose Finish. Test it. Select Run->Run As->SAP Fiori Launchpad Sandbox. We have been asked about login and password to the frontend server again, and.. Choose the setting button ( ) and check all column. Also we can use filtering, sorting, grouping – try it! Then press Ok and Go. We can see the purchase order items from tables of the backend server. But, now our application is running on Web IDE as sandbox. Thanks for sharing. It’s very useful ! Great piece of work. when we will see part 2 please? 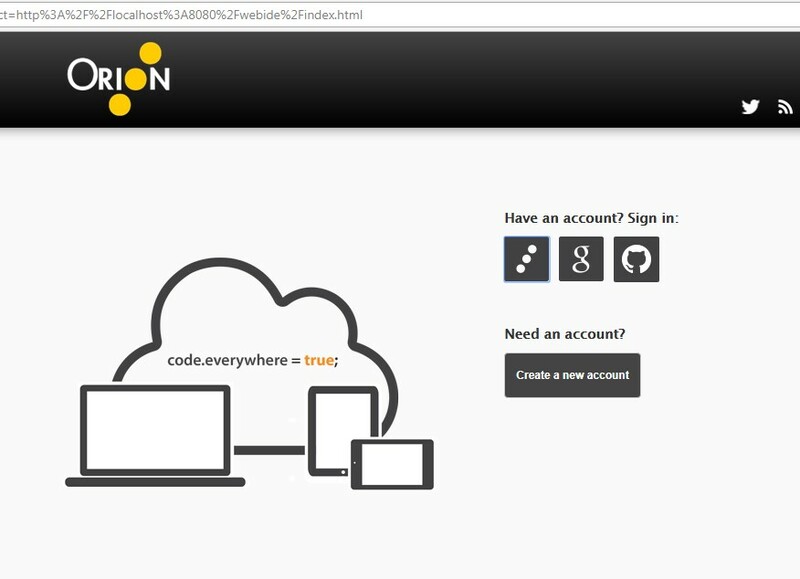 I wrote the blog that everyone can try to make a FIORI application without having cloud accounts or big experience in JS or CDS. Second part have been published. Hi Sergii. Thanks a lot for this blog! Unfortunately I have stopped at the moment of selection of my connection in WebIDE – nothing has appeared in the drop-down list and I can’t select the connection. Perhaps smth wrong with my file – what extension should has this file: .txt or another one? or maybe you have your own idea about the reason of this situation? Nice blog. Thank you for sharing. It is good one for the beginner. 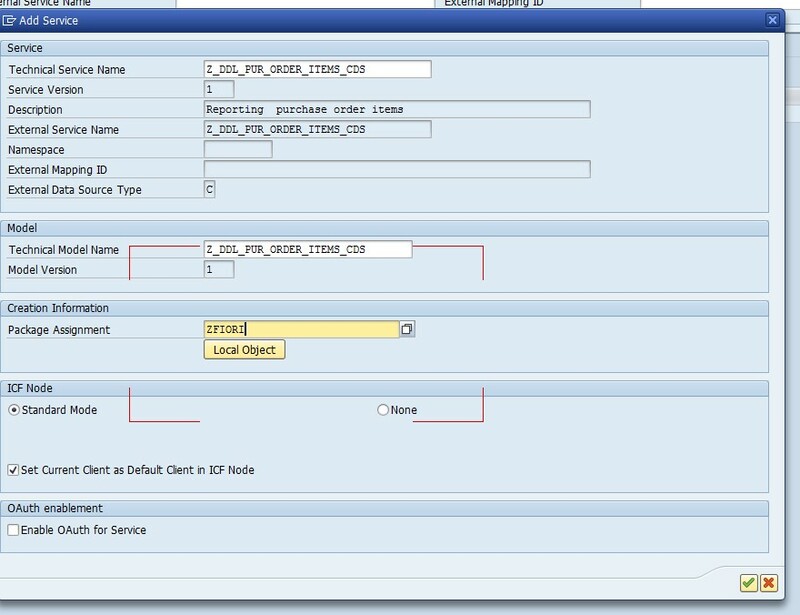 Is the SAP ABAP layer is mandatory for develop a custom Bolt on application for S4 hana in FIORI? What is role of Hana Advance XS application server in Hana? I have done the 1st 3 steps. For the 4th step, I do not have the SAP WEB IDE and I believe I need to pay some bucks to get the WEB IDE installed. Is it possible to build the Fiori Application to consume the CDS view using eclipse?